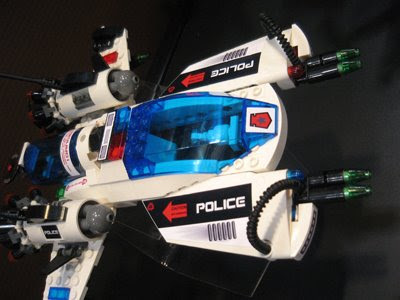 Take a close look into the photos from the new Space Police sets, exhibited last weekend at the 'Canadian Toy & Hobby Fair'. Do you see, those new white panels!? 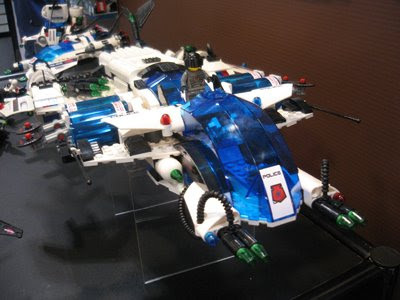 Realize on front wings at the image on the left and the smaller top rear cockpit wings, on the spaceship at the image on the right. Don't know if I should call them a redesign from the already existing TECHNIC panels (44350/1 and 44352/3), or simply some new panel designs. However my best guess it is, this a replacement redesign which aims to achieve a broader usage for these new panels, as we can see from their usage in the new Space Police sets. The introduction of straighter lines or continuous surfaces makes them more suitable for such alternative usages. Maybe it has also something to do with less expensive molds, less expensive mold maintenance and/or lower production costs!? Here some examples from the equivalent old panels. These new panels, have some design details very similar to those used in the panels that have been introduced in the last seasons (2H2008 and 1H2009) and constitute a natural evolution of those. Also this new series of panels have a design characteristic in common, which is the possibility to connect one or several TECHNIC pins with orientations aligned to the panel three main orthogonal axles. Above the mentioned examples, for better visualization and understanding. The new panel series, also miss the notch from the former panels design, which was many times used in TECHNIC models, to fix the 7mm ribbed hoses. At least, we get some extra freedom and available possibilities to connect a panel into a construction. This flexibility should make it easier to find other ways and solutions, to attach them into new MOCs and official sets. Most likely, they will be used at some future TECHNIC sets, too. Are there more panels in the NXT 2.0? As far as I can see, it just have a couple of these. Well, on the arm I see the color sensor. Is that you are referring as shoulder. Above I just see some TECHNIC beams, unless there is something hidden, I can't see. Well... from another photo there might be also the 61070 and 61071 on the shoulders. These are visible also at one of the models with the colored balls. yes I think thats what they are.. I have not seen them before. They are the same which come with the new Moto Quad (8262).